Hello I have a couple of framed pictures from this artist. I no longer want them and would like to sell them. This first picture is of the Bedouin man in a camel looking over the Nile (I think) The second picture is the man dressed in orange, selling oranges sitting under the palm tree. I will happily send pictures - just let me know. These cake from my elderly mother who picked them up from an auction donkeys years ago. They have the original Victorian dark wood back with chain and glass front. Hi Louise, Thanks, I will reply directly to your email address. Roger. 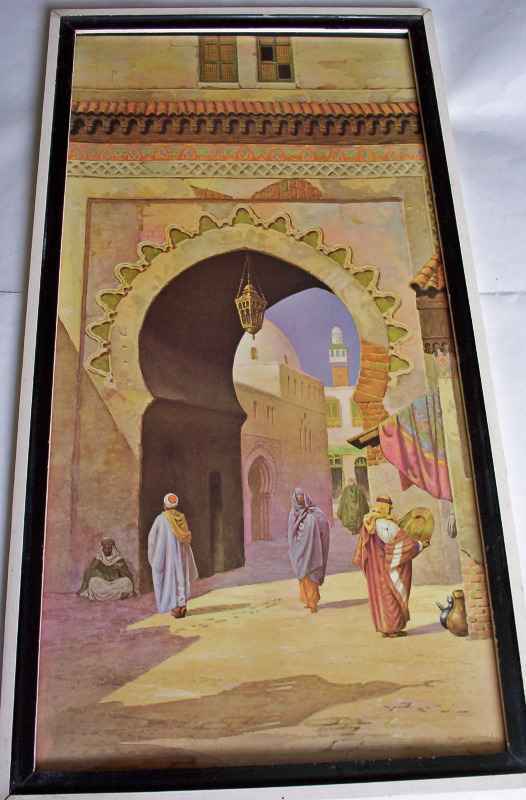 Hi I have two pictures with a man selling oranges and a man on a camel are they worth anything thanke Hi, Thanks yours. Will depend whether print or original - I will contact you by email. Hello I have two 'antique' original watercolours with the signature of 'A.Hassen' - very typical of the era - delicately painted palm trees camels decaying architecture desert sunsets etc. I am wondering if this artist is connected in some way. I note there now seems to be less of these (I am guessing once 'souvenir' paintings) around these days - I recall they had great 'popularity' in the 1970s. Any info would be much appreciated. Best wishes Hi Della, Thanks your enquiry. I would like to see the paintings and close up signatures. Please send images and then I can reply to your questions. Will also contact you directly on your email. Regards, Roger. Hi, We own one print from that artis. I would love to know more about the meaning of some of his subjects and its context. I can send you a picture to add to your database if you like. 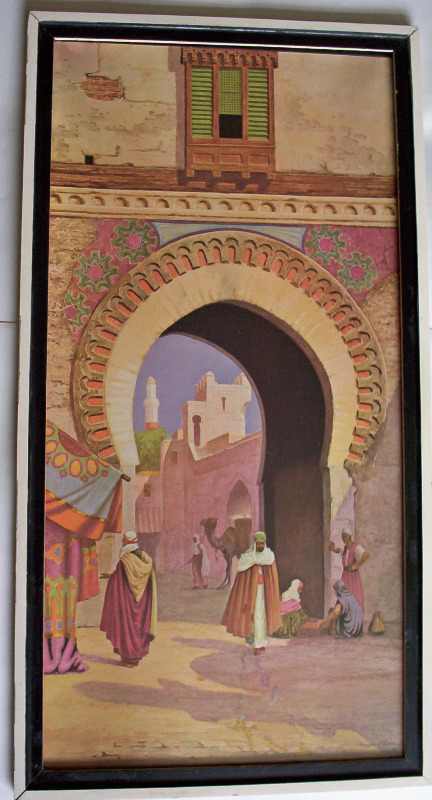 It looks like a litho, in a round black frame, depicting a scene I am not so sure about: a wose woman with an Egyptian sceptre is showing the way or teaching something to a traveler who is accompanied by a second man, on camel (could be something to do with an oracle, or Moses or else. I really don't know where to start to find more clues, at that stage. I love it and it is has a good place in our corridor, where the light play beautifully with the changing colours during the day. Thanks your message. I will email you directly. Please ,I want to know the price and information print of watercolor the 255.00 mm x 450,00mm c1900. thak`s. f.c.d. Hi Fernando, Sorry these are not currently for sale. Please watch Shop Orientalist Category for any future sales or select name of artist in List. Thanks for your interest. Please reply if any more queries. FYI- Hassan el Yashmid worked under the name of Victor E. Pickup as well. See Waddington's auction coming up 02/25/2016 American and Modern online auction where we have a pair of oils depicting a North American Indian in canoe. Thanks for your message Susan. 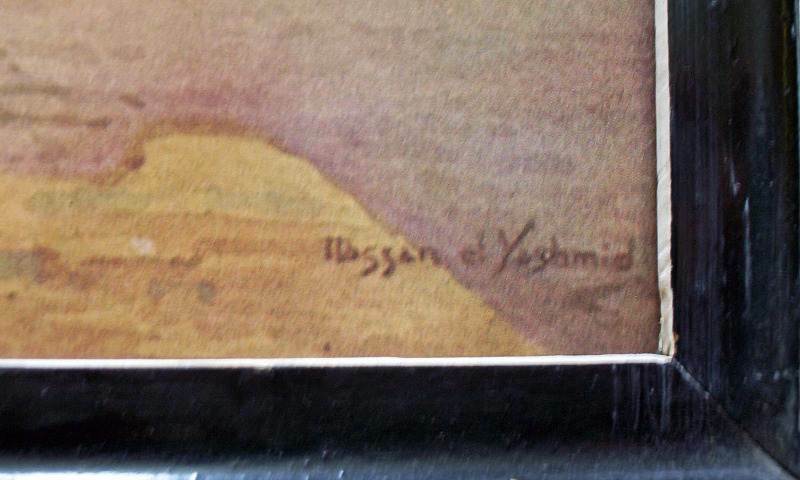 Yes, we have now accepted that el Yashmid was probably an alias of Victor E Pickup. The style is very clear. Thanks for your interest. Hello, I have come across what could be a watercolour?? signed by el Yashmid in the bottom left hand corner. It was found in a damaged frame but when I took it out it looks as if it was cut down on the left hand side to fit the frame! 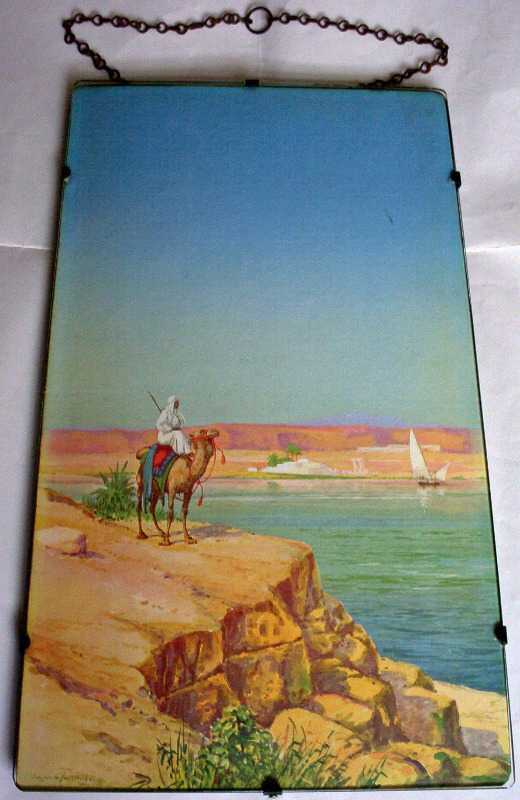 it shows an Arabian man on a camel overlooking a lake or river with a passing dhow? boat. The picture has been pasted on to a board but is in textured paper and not the kind of paper I would associate with a print. My husband used a damp cotton bud and gently rubbed in various areas and there was transference of matching colour. Would this happen with a print? Any information you could provide would be very welcome. Many thanks jackie Thanks your message. The colour can transfer on a bud in some cases but wouldn't advise using this test. Textured paper is used in a lot of that era prints and tends to suggest this is probably a print but not certain. Please look at the print under a glass to see if any dots are visible. Could you please send me images of the picture to my email [email protected] this may help me. It sounds like one of Yashmid's well known paintings (is it included in my blog images?). Look forward to your reply. Kind regards, Roger (copy yr email ads). i have 2 of those prints,very nice they are two, one is a bit,bigger than the other one i have,and they are two different subjects,one is longer than the other one,, Hi Alec, Thanks your contact. Are they different subjects to the ones listed here? If so please forward images and I will list them on the Blog to add to the collection. I will copy this to your email ads also. I have now found my 4th print! I still have to find the arched prints, which I really like. I'd found them on ebay but the seller wouldn't post them - collection only. I was very frustrated! That's good to hear. I'm still in India but returning soon. Feel free to forward images by email and I will post on the blog if you wish. Best wishes, Roiger. I have three of the above prints. I absolutely love them! Thanks for your message. Yes they are wonderful prints and well worth keeping and enjoying. I am in Ranchi India at present and will be updating the website from here as I get everything organised. I've got two of those pictures Please reply me back. Reply - Thanks yours Danny. Will email you directly. Hi Phil, Have sent you a reply by email plus the addition to your post below. 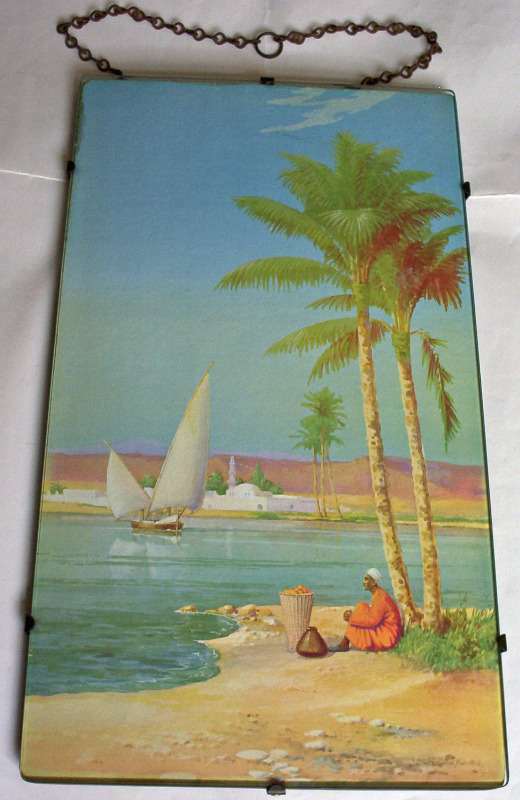 Hi,Just came across the name Hassan el Yashmid on two of the prints detailed above pasted on board beneath glass.Bedouin tribesman across nile and A well earned rest.I guess from the comments made they have no real worth.My father bought them in 1920s,I think.Time to clear out. Hi Phil, Depends on the condition and whether you like them. They are not worth a lot but of value to someone with the interest. Do you have a local auction house? Suggest taking them and putting in without reserve or follow advice from the auctioneer. I wouldn't like to see them "dumped"! WRONG,had them out of the frames they`re prints,damn! never mind they`ll go back in the wardrobe.thanks anyway Sorry to hear that Kevin but not surprised. You'd be very lucky to find an original. What about on the wall? I have the arab tribsman and the arab with the falluca I`ve had my glass on both and believe they could be original.I purchased them together many years ago from a charity.I was told to check for little black dots as that would denote a print.All i see is the marks of the watercolour paper.The frames are plane black. 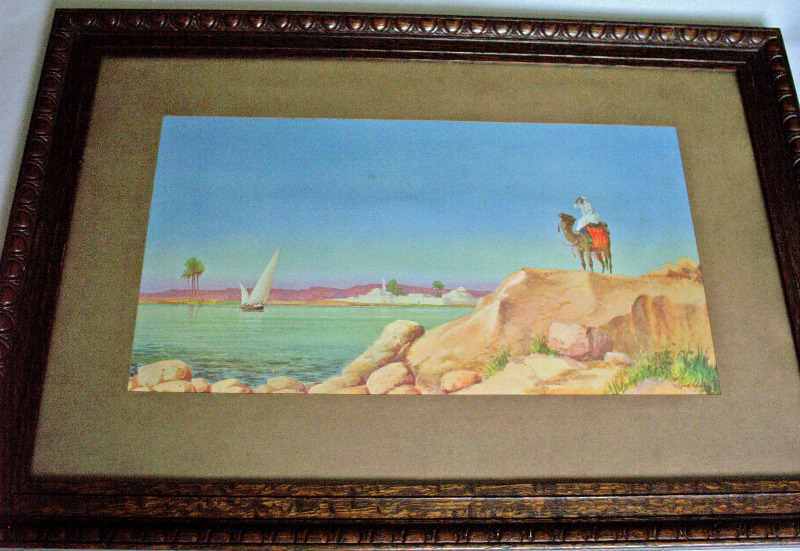 Hi There , I have two of these , i had always thought they where original water colours not prints , one is the Tribesman on camel looking across the nile with passing dhow and the other is Tribesman on camel opposite small town ,cheers OK Gary, thanks. Will contact you directly. HI I HAVE TWO PRINTS ONE IS CALLED ON THE NILE THE OTHER ONE ISON THE TIGRIST,THE ARE UNDER GLASS,ARE THEY WORTH ANYTHING,OR WILL I DUMP THEM.MANY THANKS. Thanks your enquiry. They are worth something. Can you please send me images of the prints first. I will contact by email. Thanks. I have 6 of these paintings/prints and would be interested to know what they are worth. many thanks Hi Nasir, Thanks your enquiry. Will contact you directly by email. Thanks. 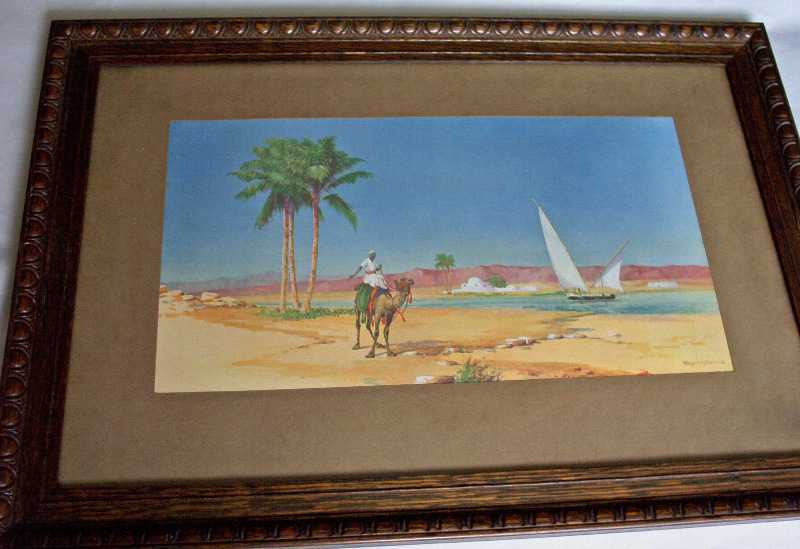 I recently purchased what I think is a print of a tribesman on camel opposite a small town with passing dhow as posted above and I'm wondering its value. Thank you! Have replied to your email address - Roger. the fourth picture is called A Well Earned Rest Hi Marti, I tried to email you but your Mailbox is suspended. I will copy my email message here : Hi Marti, Thanks for your message posted on my blog. That is very interesting. Are you referring to the 4th image down known as the "Orange seller under palm tree..."? That would explain why there are no customers in the vicinity! I guess you must have a copy of this painting (or perhaps even the original) with that title added. I will be very interested to know more about this. I have seen several of his prints framed with a title plate attached to the lower frame. Look forward to hearing from you. Kind regards, Roger. Ranchi Art & Antiquarian Books. Hi Marti, Have tried your email several times but there is still a problem. Please check your email/address is correct. Thanks. just clearing my loft and came across 2 prints by Hassan el Yashmid. The names on the frame are 'Prayer at Sunset' and 'Gossip'. What would they be both worth? They are in the original frames, one is slightly damaged. I've just been clearing my loft and found 2 of Hassan el Yashmid's paintings/prints, the same as the bottom two depicted above. They are mounted on card and in plain gold coloured frames. Hello Janet, I will contact you directly regarding these. Thanks. I have inherited one from my Aunt and it is a different scene to the ones you have posted. Hi Laura, Thanks for your message. Please post a copy of your picture. I will be very interested in seeing it and any information you may have about the origin and dates etc. Is it a print or an original? Any problem posting a copy then please email an attachment and I can post it for you. Look forward to hearing from you. Roger.